Skye's job was to tend to the garden and make sure all the flowers were happy. On rainy days that was hard to do. Since she was so tiny, the breeze blew her into the daffodil trumpets. Sometimes a bee would be inside gathering pollen, or perhaps a butterfly collected nectar and didn't appreciate Skye getting in the way. When raindrops splattered on her head, it hurt. She usually had to hide under a toadstool until the storm passed. She always wore a pale blue dress that matched her gossamer wings. Tiny blue slippers fit on her pudgy feet and her hair sparkled with tiny bits of fairy dust. One day while Skye was sipping morning dew drops from a pale pink rosebud, a terrible wind arose. It blew so hard that it ripped Skye's shoes and dress off and all the tiny sparkles washed away in the rain. Skye went flying through the rose bush and landed on one of the sweet pea vines. She grabbed hold of it and held on for life. 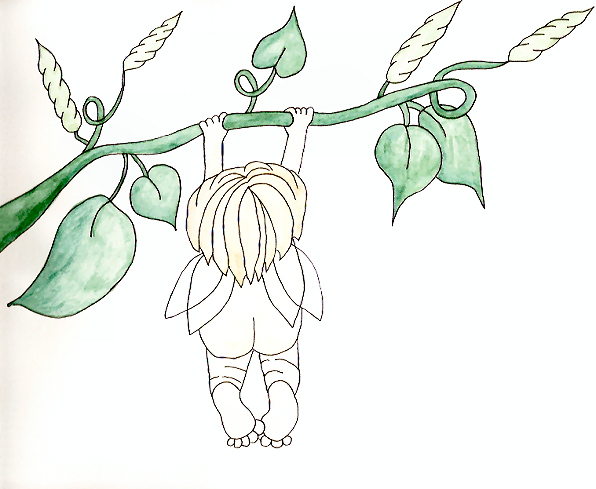 Her legs flew up and her wings flapped so fast that she thought they might tear. When the storm ended she let go of the vine and fell to the ground, landing next to a huge toadstool. A hummingbird flew by and saw the fairy. She knew that Skye devoted her life to taking care of the flowers that the bird sipped from. It used its long beak and plucked two feathers from its wings. She let them flutter down to Skye. Skye smiled at the hummingbird and waved thank you and then used the colorful feathers to make a new dress. She slipped an acorn cap on each of her feet as shoes. Whenever Skye flew around the garden, nobody could tell if it was her or the hummingbird.